Can You See Me Now? 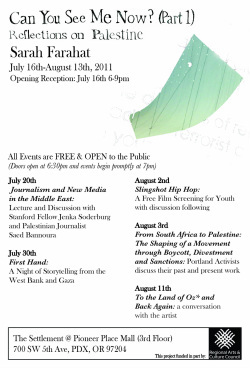 (Part One): Reflections on Palestine is the culmination of two years of thought, travel and art making. Sculpture, events, photography and discussion make up the body of this work. Parts of this work were exhibited/experienced at PLACE gallery, Portland Central Library, Tribute Gallery, Portland Center for Performing Arts and circulated in other ways.